More scenery has been added - what a difference! Did we pull a switch? The last 3 photos here show the layout with scenery. Actually, I took the train from Hoboken to get there - that's when I also took the photos of Lackawanna Terminal! 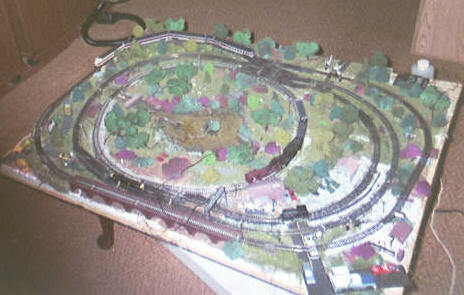 These are the first photos of Dad's layout with its new scenery. I'm sure you appreciate the difference! 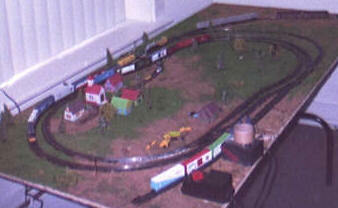 The next three photos show our own 32" by 40" layout. 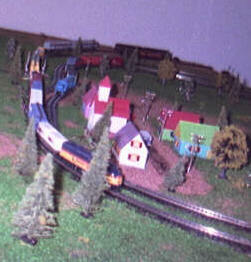 The background shows just how small this layout is! Our own layout has 3 loops, a lake, and two tiny stations. Look closely - you can see a Lackawanna E8 with the Phoebe Snow passenger liner, an RS3 haulking the local, and a work train on the middle arc. The beauty of N scale is that it can fit almost anyone's living space and it looks beautiful! This entire N scale layout takes up only 32" by 60"! 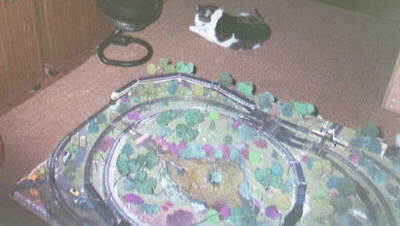 It took a couple of hours to do the roadbed, track and wiring, and a couple more to finish the scenery. We used Atlas track and switches, LifeLike operating crossing gates, LifeLike Grass, Earth and ballast, various brands of trees, houses, miniature vehicles and people. The diesels featured here are the Bachmann Chessie F9a (top right) and LifeLike Milwaukee SD7. In the third picture on the right, you might be able to pick out a Model Power Conrail C-420 moving parallel to the Chessie train. The photo immediately above gives you a clear idea of how things looked before scenery was started. 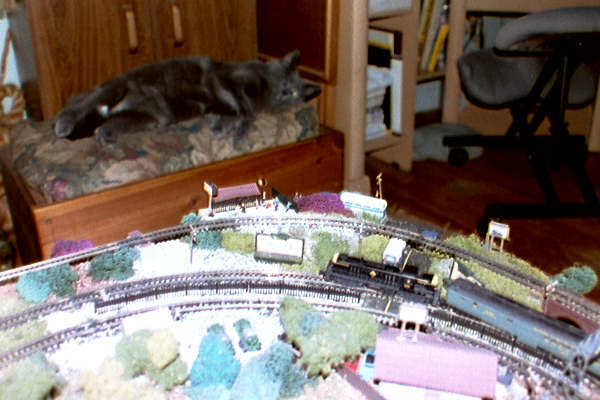 Yes, even folks living in apartments can have model railroads thanks to the many scales and the tremendous amount of trains and accessories.